The New Hampshire Horticulture Endowment (NHHE) was founded in 1997 as an extension of the New Hampshire Plant Growers Association. Each year the NHHE grants money to researchers working on related issues in the field of horticulture that will assist New Hampshire Plant Growers. Proceeds from this bag of soil will be used to help grow The NHHE fund. Your support in making this purchase is helping to make New Hampshire a greener place to live. Ask your local NHPGA member about it! Our New Hampshire Plant Growers All Purpose Container Mix contains the highest quality ingredients to provide a professional blend that will support excellent plant growth - whether in a window box, container, raised bed, garden plot or any garden bed in your yard. 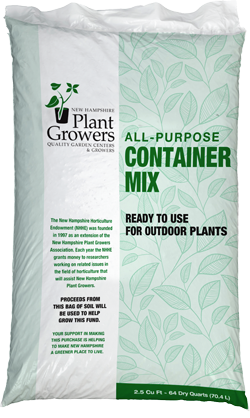 New Hampshire Plant Growers All Purpose Container Mix is formulated to be placed directly into window boxes, raised bed or any container you choose, but may also be used as an important part of improving your existing soils. This mix will help you grow a great harvest of vegetables and flowers for your family and friends.